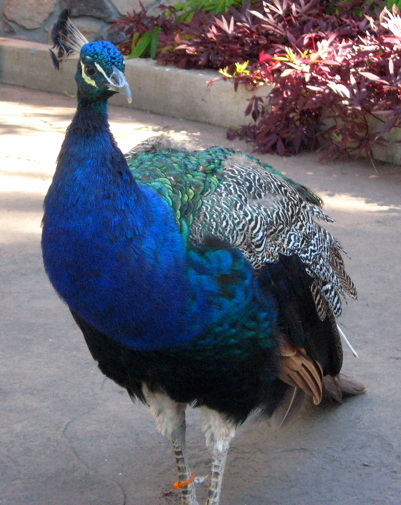 That’s a peacock. Of course, you and I already knew that, but there is still an air of mystery about him. We encountered him as we were strolling through the Cincinnati Zoo & Botanical Gardens. By the way, combining the zoo with the botanical gardens is a great idea. This place has the loveliest landscaping of any zoo I’ve ever visited. I could also say that this place has the most diverse fauna of any botanical garden I’ve ever visited. Anyway, this peacock was strolling about unleashed and unattended. He was perfectly content to let me stoop down right in front of him and take his picture. So given his lack of restrictions, the mystery is this: Does he live there, or was he simply a fellow guest taking in the sights? 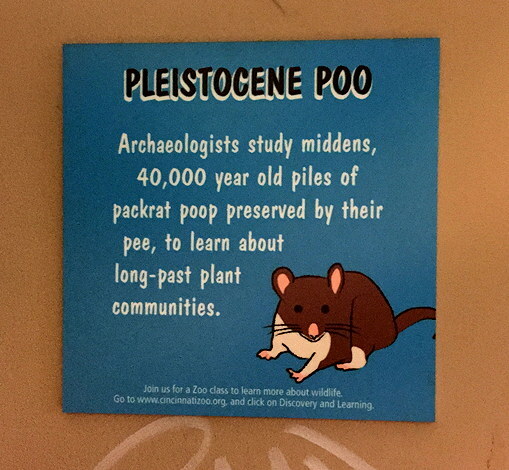 This was also on display at the Cincinnati Zoo. Specifically, it was on display inside a stall in one of the men’s rooms. You’ve gotta love creative signage! This is a portrait of CC relaxing in far eastern North Carolina. I’ve just now taken another look at this photo and realized that there’s something else on prominent display here – that object behind her with the diagonal black & white stripes is the Cape Hatteras Lighthouse. 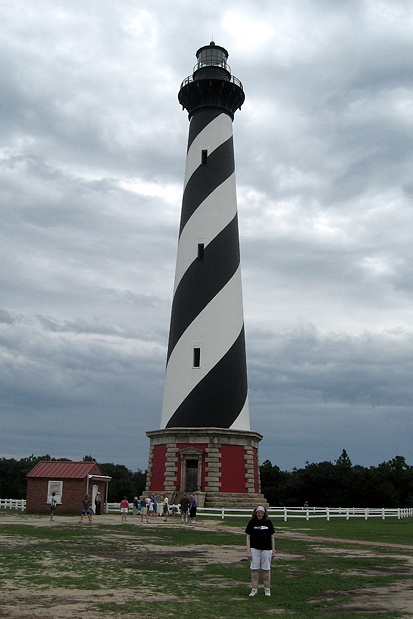 At 210 feet in height, it’s the tallest brick lighthouse in the United States. We arrived there fully intending to climb all the way to the top. OK fine, don’t believe me. Really, we were going to do it. But fate intervened in the form of that ominous sky you see in the background. A few minutes before we arrived, thunder was heard by the people whose job it is to listen for such things, and the Park Service temporarily closed the lighthouse. We hung around for a while and toured the visitor center, but it never reopened while we were there. 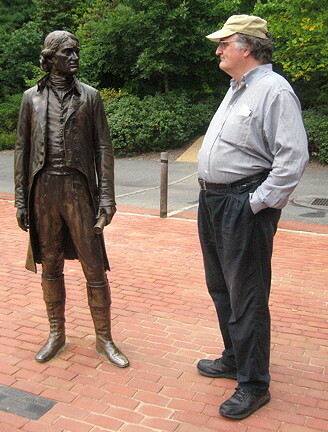 This is me having a stare-down with my old buddy Thomas Jefferson. I’m the one on the right. Tom won the stare-down, by the way. Again. We’re standing near his home, a place he called Monticello. I didn’t mention it at the time, but by the look of things, Tom has been spending way too much time outdoors without sufficient sunblock. There’s quite a story behind this photo. We’d been in Charlottesville, Virginia and we wanted to be in the Detroit area in two days time, so I scanned the map and looked for a city about halfway between the two. I settled on Marietta, Ohio based purely on its geographical location. Since we had some time that morning in Marietta, we decided to check out some of the local history by paying a visit to the Campus Martius Museum. 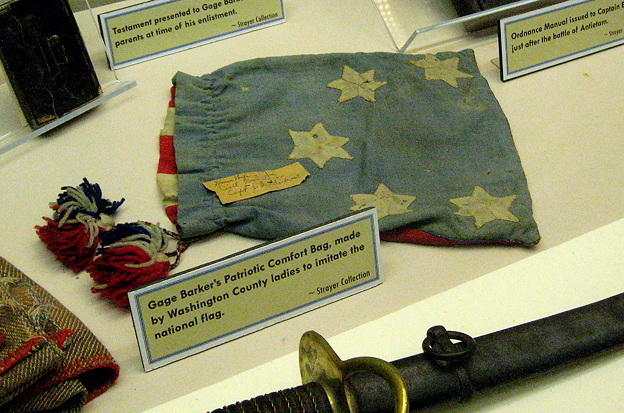 When we got there, we learned that they had a temporary exhibit on the second floor consisting of Civil War memorabilia mostly belonging to an avid collector, one Larry Strayer. What’s more, Mr. Strayer happened to be at the museum that morning. We went up to the second floor, introduced ourselves, and were treated to a personal tour by Mr. Strayer, who was able to fill in a host of details that weren’t printed on the museum display cards. His collection includes uniforms, weapons, photos, and a great many other objects, some quite rare and historically significant. It is one of the best collections of Civil War material I’ve ever seen. If you’re interested, the collection will be there until about mid-November. That’s it for this year’s trip. It contrasted greatly with last year’s trip, which you can read about if you’re interested – just scroll down in this journal to my entry from July 2014, titled “Swirling Around Nebraska”. Last year’s trip took us west; this year’s trip went southeast. Last year’s trip consisted of a lot more driving; this year, we wanted a bit more time to stop and smell the native flora. Next year, who knows? Maybe it’s time for that long-delayed road trip to Tierra del Fuego.